The Republic of Moldova has committed itself to ensuring the implementation of the provisions of 1325 UN Security Council Resolution on Women, Peace and Security through multiple instruments at national level, the most recent of which is the National Program and National Implementation Plan for 2018-2021 period. 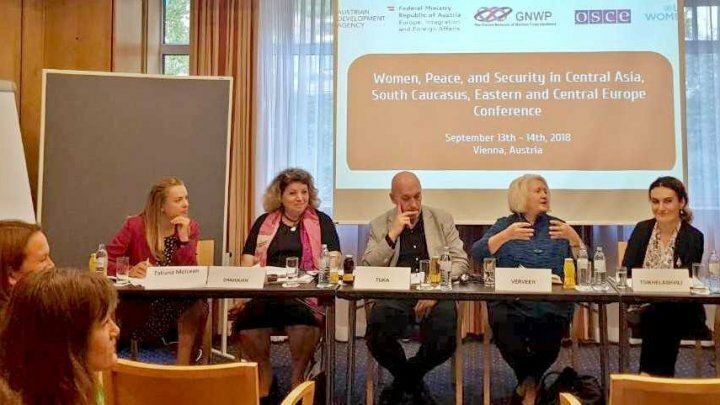 Tatiana Molcean, the State Secretary at the Regional Conference on Women, Peace and Security, organized by the Global Network of Women Peacebuilders (GNWP) and the Austrian Development Agency (ADA) is taking place in Vienna from 13 to 14 September this year. Tatiana Molcean stressed the importance of continuing efforts to promote women's participation in security and defense, peace-building and peacekeeping missions, reducing stereotypes about the role of women in the sector, and enhancing transparency in decisions and preventing and combating discrimination, sexual harassment and gender-based violence in the sector. The event brings together high-ranking officials from the Eastern Partnership (PfE) governments, such as Armenia, Georgia, the Republic of Moldova and Ukraine, including representatives of civil society and relevant regional organizations from Central Asia, South Caucasus, Central and Eastern Europe, EU, NATO and OSCE. Leaders call for the purpose of sharing the experience, strategies and lessons learned in the development and implementation of National Action Plans in the field, in particular the implementation of 1325 UN Security Council Resolution on Women, Peace and Security.